We propose a novel segmentation method based on multi-label graph cuts utilizing higher-order potentials to impose shape priors. Each higher-order potential is defined with respect to a candidate shape, and takes a low value if and only if most of the voxels inside the shape are foreground and most of those outside are background. We apply this technique to coronary lumen and plaque segmentation in CT angiography, exploiting the prior knowledge that the vessel walls tend to be tubular, whereas calcified plaques are more likely globular. We use the Hessian analysis to detect the candidate shapes and introduce corresponding higher-order terms into the energy. Since each higher-order term has any effect only when its highly specific condition is met, we can add many of them at possible locations and sizes without severe side effects. 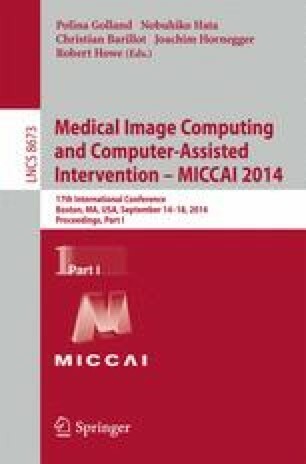 We show the effectiveness of the method by testing it on the standardized evaluation framework presented at MICCAI segmentation challenge 2012. The method achieved values comparable to the best in each of the sensitivity and positive predictive value, placing it at the top in average rank.